The Gibson ES-175 cutaway came onto the scene in 1949 as a single pickup archtop with a sharp florentine cutaway and Maple laminate body construction. 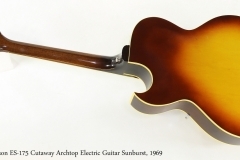 The most popular electric archtop at the time was the ES-150, with carved spruce top and carved Maple back. The laminate construction of the new ES-175 was not only more affordable, but also offered better feedback resistance. The ES-175 design has been very influential and has remained as a standard, workhorse guitar for musicians of many genres. 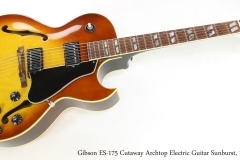 This Gibson ES-175 cutaway was built during 1969 at the historic Gibson Kalamazoo, Michigan plant. It’s in very nice condition with all original parts. This particular example has as somewhat larger neck than many of the period – narrow, thin necks were popular at that time. It has been refretted, and a new nut installed. It plays very well. An older Gibson-branded hard shell case is included. “When the ES-175 debuted with a run of 129 in 1949, it nudged aside the ES-150, which had been the guitar of choice for jazz innovators like Charlie Christian and Eddie Durham. The ES-175 also proved a more manageable and less costly alternative to the L-5s thanks to its smaller body size and laminated top.